Sea ice cover reaches its seasonal minimum around mid-September every year, and recent years have seen it reach record lows. 2016 looks set to become the second lowest on record since the record minimum of 2012. As Arctic scientists tackle the extent to which the extreme Arctic warming is driven by external oceanic and atmospheric influences, researchers at Bangor University have found that there has been no evidence of increased stirring up of heat by winds from inflowing Atlantic water. 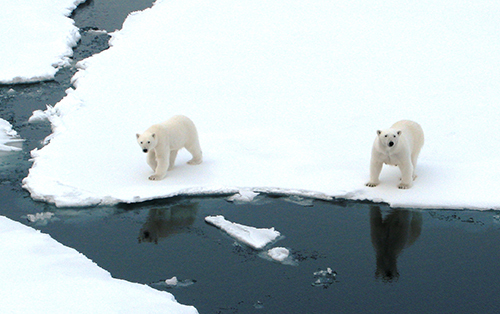 In the Arctic Ocean, there is enough heat in the sub-surface waters that originate in the Atlantic (the largest oceanic heat source) to completely melt the Arctic Sea ice cover within two years, but thanks to a layer of cold fresh Arctic water, this warm water is isolated from the sea surface and also, therefore, from the underside of the sea ice. Despite it being widely believed that as the sea ice declines, the wind will become more effective in stirring up the surface layers of the ocean, bringing some of this heat to the surface. However, Bangor University’s recent research contradicts this. Professor Tom Rippeth, School of Ocean Sciences, explains: “A series a new measurements made by our research team during the ‘perfect storm’ of record low ice levels and the strongest Arctic storm ever recorded in summer, in August 2012, show that this is not the case. The measurements show that, despite the ice-free and stormy conditions, there was no evidence of increased stirring up of heat from the inflowing Atlantic water." These were reported in collaboration with Yale University, the Canadian Department of Fisheries and Oceans, Woods Hole Oceanographic Institution and the National Oceanography Centre. The new results, which are to be published in Geophysical Research Letters, support the Bangor team’s new model for mixing in the region that enhanced stirring up of heat will be restricted to the ocean’s perimeter, where mixing near the steep continental slope can be driven by strong tidal currents as well as the wind.